‘Tis the season for food, friends and family! The holidays are often the time of year when you entertain on a larger, more elegant scale. With Mozaik, you can throw a festive, stylish soiree with ease! Mozaik offers the ease of using disposables without sacrificing style; simply toss the mess for an easier clean up. You can also opt to reuse Mozaik, just hand wash or place the party ware in the dishwasher on the gentle cycle. The more care they are given the more times you can reuse them. To prove that your table’s appearance can be stylish and sophisticated when you use plastic, Mozaik expert Jennifer Lucas will appear on WEtv’s Designing Spaces TODAY, November 19th, AND ALSO November 21st and 22nd at 9:30 a.m. EST to share tips on how to entertain with more style. Check local listings for airtime and channel number or visit www.designingspaces.tv to view the segment online. I plan on taping the episode today so I can watch it at a more convenient time. I hope you'll be able to tune in too! 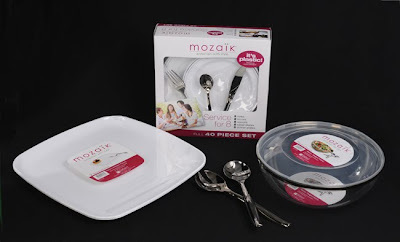 What was included in the box (and what the giveaway winner will also receive) is a FANTABULOUS Mozaik “Designing Spaces” prize pack which includes Mozaik’s new Service for 8 kit (full 40 piece set), serving utensils, platter and bowl. As I picked up the items, I couldn't help noticing that everything looks like the "real thing;" even the silverware and serving utensils. I was practically jumping up and down with joy! I cannot wait to set my Thanksgiving or Christmas table with these gorgeous pieces....my table is going to look stunning! How to Enter: visit www.mozaikbysabert.com and tell me one thing that you learned. The Giveaway will end on Saturday, November 27 at 11:59 CT. I will choose one winner by www.random.org and contact them by email. Whoever is chosen will have 48 hours to respond back with their contact information. I am UBER excited about this one and I hope you are, also!!!! WOW! This stuff looks fabulous. The website for the Mozaik products was really well done. I love the fact that the dishes are disposable and don't cost much more then using regular disposable paper products. I tried to find out what the actual price was but I didn't see any prices listed online. It looks like a lot of retailers carry this product so even if I don't win (sniff, sniff....can I possibly whine any louder down here in FloriDUH....I need a kleenex, sniff, blow....hahaha) I am going to find a store that carries this down here. 4. I tried to earn an extra entry point by logging into your networkedblogs site but I got an error message saying that the blog does not exist. Doesn't matter. I think I should get the point anyway - kind of like when I give the students an "A" for effort??? hum???? Whine??? I follow your My Money Mission blog too. I follow u on networkedblogs. I entered your Hamburger Helper giveaway. "Mozaïk® plasticware does not stain – just use a little soap and water and all of your dark, heavy sauces will wash right off!" *Thanks* for the giveaway! I learned that I need some of this! It is beautiful! No, really, I learned that the products are BPA free. I am google follower of My Money Mission, too. BPA free..can be recycled, ru-used and easily disposed of. I learned that you can put hot products on all Mozaïk® plasticware!